Framing carpentry has always been my favorite phase of home building. At the end of a day's work, you can see the fruits of your labor standing tall in the sky. 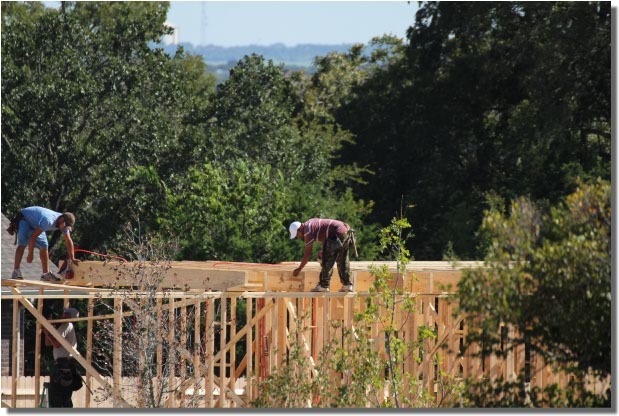 A good framing crew can frame an entire house in just a couple of days. You can learn these framing techniques too. Explore the following tutorials to get more information about each task. 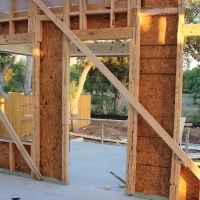 Framing a wall - isn't too difficult, but there are a few things that are important to know before you get started. This tutorial explains how to lay out a wall with windows and doors. Framing a ceiling - ceiling joists are used to support the ceiling surface materials. In a two story residential structure, the floor joists on the second level often serve as ceiling joists on the first level. 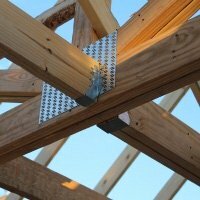 Roof Framing - you can learn a great deal about roof framing by understanding the concepts of gable roof framing. This roof type has all of the basic elements of the other roof types. 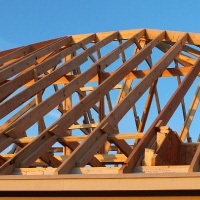 Learn the math you need to know to build all types of roofs. Framing a Door - This tutorial will explain the parts of a framed rough opening, and guide you through the basics of door installation. 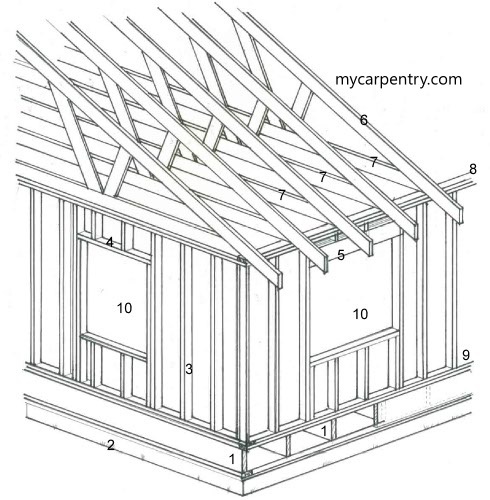 The drawing below identifies some typical framing components such as rafters, studs, joists, and headers. 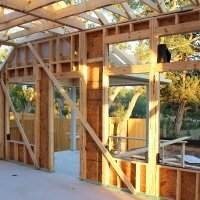 Whether you are framing a wall or framing a door, framing any structure correctly is an extremely important task. If the walls are not square or plumb, or if the joists are not straight and level, every subsequent phase of construction will suffer for it. Doors and windows won't hang properly. Drywall, roof decking, and trim work will be difficult to work with, etc. Take the time to frame your structure correctly and every other phase, from drywall to final finish will go smoothly. Check out the carpentry calculators, carpentry math, and the how to build it sections on this site for more information related to framing carpentry.